If you make easy rabbit figurine together with your kids, one of them may ask you, "where are the other two legs?" Good question! Well, I'm sure you'll have a long conversation with your kids while making the figurine with them. Alright, let me show you how to make this rabbit clay. First of all, choose your clay. I am using a home-made cold porcelain clay for this little project. I used pink, white, light brown and black clay color. As for the tools, I used clay ball tool and toothpick. Let's make the head and face of the rabbit. Roll pink clay to a ball shape at about 1/2 inch in diameter. You can make smaller or larger size if you like. If you want to make a big rabbit with head diameter about 2 inches, I would suggest you to use Styrofoam ball as backing. Cover the Styrofoam ball with clay and leave it to slightly dry. Roll white clay to two small teardrop shapes and paste it on top of the mouth. Prick these with toothpick. Next, make the body of the rabbit. Roll the pink clay again to an egg shape. Mine is about 1.5 inches long. Again if you make a big rabbit figurine, use Styrofoam egg shape for the body. Roll white clay to an egg shape, flatten it and paste it to the front part of the bosy. You can insert the toothpick to the body and leave it to dry slightly and then attach the head on to the body. Roll 2 small round ball shapes in pink color clay, press the ball shape lightly on your work bench and make two lines with toothpick or clay knife. This would be the front legs. And, make small egg shape for the tail. Paste the legs to the body and tail at the back. 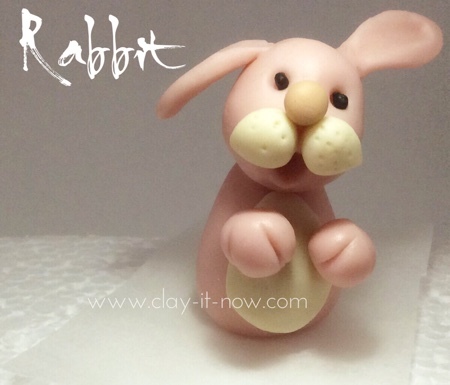 Did you make the rabbit figurine following our tutorial? Do you have different style? We would love to hear from you.